My book, "World Cinema: Israel" (originally published in 1996) is available from Amazon on "Kindle", with an in-depth chapter comparing and analyzing internationally acclaimed Israeli films up to 2010. Want to see some of the best films of recent years? Just scroll down to "best films" to find listings of my recommendations. The Lost Crown, directed by Avi Dabach, documents the story of the Aleppo Codex, better known as the Crown. This is a fascinating film which, like a good detective story, tells a story of intrigue, murder, and even cultural appropriation at the hands of the government of Israel. The Aleppo Codex was written on parchment in the 10th century and is the most ancient manuscript of the Hebrew Bible. Today it is located in the Shrine of the Book at the Israel Museum, but about 200 pages of the manuscript are missing. The manuscript was kept in the Great Synagogue of Aleppo, which was destroyed in a fire caused during the riots of 1947, following the UN vote on partition. Even though the Crown was rescued from the fire, it is still unclear what happened to the missing pages. The filmmaker, the great grandson of the Syrian Jewish man who was the guardian of the Crown, becomes obsessed with the subject and begins to try to solve the mystery of what happened to the missing pages. He interviews Mossad agents, antiquities dealers and historical researchers. He travels to Deal, New Jersey, where he meets members of the tight-knit, vibrant Halabi (Aleppo) Jewish community, who vacation there every summer. When he returns to Israel, to continue his unrelenting investigation, it becomes clear that we are still in the dark about what happened to these priceless pieces of manuscript. This is both a personal quest for the filmmaker and also an attempt at righting a wrong that was enacted in the name of the State of Israel, a kind of cultural interventionism and paternalistic appropriation on the part of officials of the State. I loved this film and I was absorbed as the filmmaker works to unravel a 20th century mystery. You can learn more at an investigative website, which has been produced in cooperation with KAN TV, the Israeli public TV network. 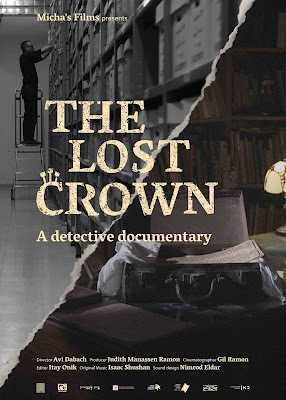 The documentary film, The Lost Crown (60 minutes) is available from the producer, Judith Manassen Ramon, at Micha’s Films. Watch for its premiere at the Sephardic Jewish Film Festival in New York City in the middle of next month. Watch the film’s trailer! writes and lectures widely on subjects dealing with contemporary Israeli society as seen through film and is the author of two books on the subject: World Cinema: Israel (Flicks Books, Trowbridge, England and Associated University Press, Fairleigh Dickinson, NJ, 1996, updated in 2010 for digital reader) and Israeli Film: A Reference Guide (co-author, Greenwood Publishing, Westport, CN, 2003). Both books are available from Amazon for use on a digital reader. Check out the letters of appreciation that I have received from my speaking tours! On behalf of our Sherith Israel Congregation I would express my sincere thanks for the superb program on Israeli film that you presented last Saturday evening. Your passionate love for film and, of course, for Israel came through in the dramatic clips that you showed and in the very lively discussion that you inspired. You have a very special gift for bringing your listeners into the challenging questions and themes raised by the films. Truly, your program was incredibly well-received. I would not hesitate to recommend you to synagogues, schools, and Jewish Centers throughout the country. In reference to Amy's availability as a master teacher of Israeli cinema, I wanted to share my personal testimony. Our congregation brought Amy in to lead two separate programs on a wonderful shabbat this past winter. challenging, engaging, and never patronizing to our group of kids. She spoke to them like the sophisticated consumers of media that they are, and they came away very satisfied and enlightened from the experience. these days) very easy to work with! I highly recommend her services to any congregation that is looking for a way to enrich their community's relationship with Israel through an exploration of a wide variety of issues brought forth by a sensitive, careful examination of its cinematic tradition. We were fortunate to have Amy Kronish speak on campus two years ago about Israeli film; the students really enjoyed the evening. Don't pass up this opportunity! -- Adolescents of Israel: Are They Really Different? @ amy kronish. Simple theme. Powered by Blogger.